Sunday was a busy day, three very different photoshoots in a single day to test my concentration and keep me on my photographic toes. Each shoot required me to capture a different feel to the images. A beauty shoot, a gritty drama shoot and this, the fantasy horror shoot. The whole look was the vision of Make Up Artist Stevi Stuksis for her HND graded unit. First time model Brooke did a fantastic job of bringing the character alive. As the photographer, this character brought varied photographic opportunities, from outright horror to beauty to dance. All making for a great shoot. Once we were set up Brooke got into character. I asked her to move about a little and then she came to life and her first posed instantly gave away that she was a dancer. She then hit a series of fantastic and unexpected poses, each one better than the last. The horror beauty shot was lit by a large softbox as the key light with a gelled speedlight providing the hair light. By this point in the shoot Brooke was hitting great shapes and making really interesting shots. And second last shot of the day, and my favourite image from the shoot is the classic horror shotwith theatrical lighting. Just before we wrapped up I put the softbox right down on the floor and pointed it up at a 45 degree angle at Brooke and I coaxed her into her best contorted demon face…and she nailed it. You can follow Stevi and see more of her work on Facebook. April is a great time of year for photographers. Not because of the lighter nights and the delicate quality of spring light that we start to see in the landscape. No! April is a great time of year because student make up artists are preparing submission of their end of course graded unit which invariably means some sort of gruesome special make up effects…and this year did not disappoint. This year I was privileged to shoot the graded units of three talented make up artists, Nicola Sturrock, Stevi Stuksis and Linzi O’Connor. Today’s post features the work of Linzi O’Connor who was inspired to create a scene featuring a severely wounded World War I soldier convalesce in his hospital bed. It’s incredible to watch the make up artists at work, transforming their model into a work of art. On this occasion the make up brought to life the realities of the horror of war, made all the more poignant as the photoshoot took place only a few days after an allied missile attack on chemical weapons facilities in Syria bringing international conflict a step closer. Linzi’s make up realistically depicted burns and as photographer I wanted to showcase the make up and also convey the feels of the injured soldier coming to terms with his wounds. You can follow Linzi and see more of her work on Facebook and Instagram. Please subscribe to my blog to see more of my photographs of students’ graded units and follow me on Flickr to see more of my Photography. Next time, the beautiful but horrorifying vampire goddess created by Stevi Stuksis…. Over the next few weeks I have a series of student make up artists’ special effects graded units to shoot. The themes of these shoots tends to be of a horror or fantasy nature so I thought I would warm up my horror lighting skills by setting up a creepy home studio shoot and explain here how I got the final image. To make it easy on myself I wanted to create an image that didn’t need a model or make up so I took to every photographers best friend, Ebay, and got searching for a potentially creepy looking doll. I bid on several vintage dolls with cracked porcelain heads but in the final minutes the prices always rose beyond what I was willing to pay. In the end I got a 30″ tall, 1980’s plastic doll, who in her worn state looked a little creepy. I wanted to create a low key shot with only shafts of side lighting on the doll, picking out here eyes in particular. so I needed to find a suitable backdrop and method of creating the shafts of light. Sticking to my budget approach, the background is a simple A1 sheet of black mount board and the shafts of light were created by shining an angled desktop lamp through slits cut in another sheet of mount board. I experimented with the positioning of the lamp and the slit mount board until I got the effect I wanted on the doll’s face. I spot metered from the highlights of the light shafts on the doll’s face. I shot three portrait shots and one landscape. I liked the landscape best and took it into Lightroom for some minor editing. In lightroom I adjusted the contrast, shadow levels, clarity and added grain. As you can see I did a small amount of localised editing on the eyes to bring them to prominence in the image. Overall I am happy with the final image. However, if I was to shoot it again I would bring the doll forward from the backdrop a bit more to let the shafts of light extend behind her on the backdrop to provide greater separation. Hope you like the image and a little insight into how it was created. Saturday morning kicked of with a journey from Glasgow to Edinburgh with my mate and fellow photographer, David Brown, to shoot The Edinburgh Angling Centre’s open day. In the afternoon we were free to head into Leith to get some shots for our own portfolios. This set of images are of the Stothert and Pitt cranes on the Leith Docks. These rusting behemoths looks like some sort of industrial dinosaur looming on the dockland skyline. The shapes and textures of the machines make for great photographic subjects, almost spoiling the photographer for choice. I was privileged to have an invite to South Lanarkshire College’ Make Up Artist HND Showcase event as the guest of two students, Susan Hardman and Elizabeth Newlands – thank you ladies. Getting to South Lanarkshire College for a 6pm start when leaving Glasgow City centre at 5:30 was always going to be a challenge and despite fairly clear roads and a lucky run of traffic lights I was late! Fortunately the event was running late and I caught the whole show. It was every photographer’s nightmare…far away from the runway, no clear line of sight to the runway and really low light levels and multiple lights of all different colour temperatures – argh! Unfortunately, the first couple of models were beyond my lens reach but after a bit of scouting around the room I found myself a workable position although working at ISO 6400 didn’t make for a great night of photography. A wonderful evening and I hope all the students enjoy success in their future careers. And finally, Susan and Elizabeth with their creations which have been subject to previous blog posts. Please follow my blog and see more of my work on flickr. 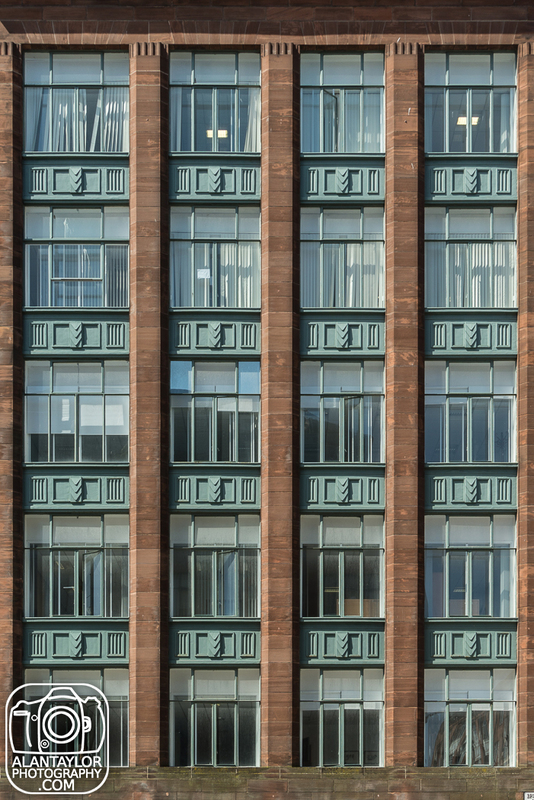 Following my City Centre wander on the 3rd of May, I really enjoyed the architectural photographs which focused on the apparent symmetry of buildings. With these photographs in mind, I took my camera out yesterday at lunchtime to see if I could add some more similar images to my portfolio. 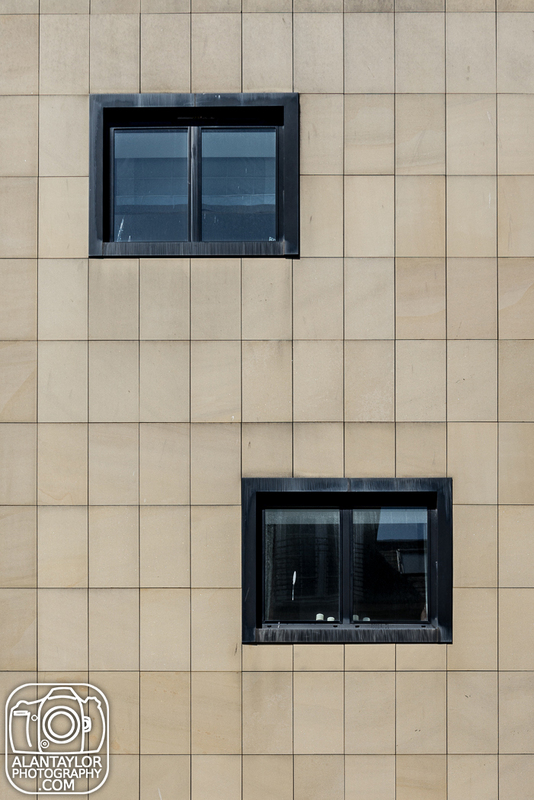 The lead image is my favourite of the day, the facade of the rear of the NCP Car Park on Glasgow’s Glassford Street. 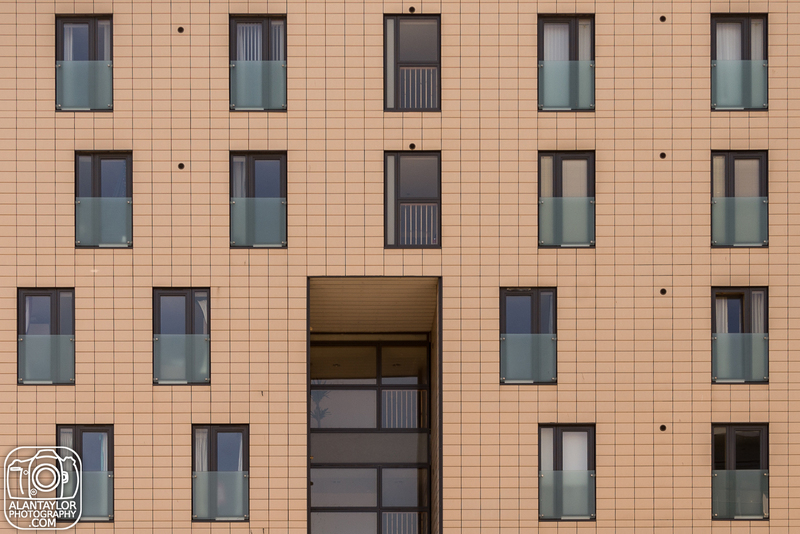 The precise horizontal and vertical lines give the impression of having been shot with a tilt shift lens. However, that’s not a piece of glass I have in my kit bag. Therefore the converging verticals were all corrected in LightRoom.